A Mindshift blog, How to Help Kids Find Their Aspirations, introduced me to the Quaglia Institute for Student Aspirations (an independent nonprofit organization dedicated to studying, promoting, and putting into practice the conditions that foster student aspirations in schools and learning communities around the world). 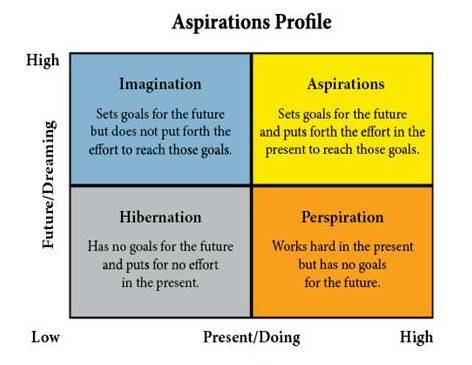 They define aspiration as the ability to set goals for the future while maintaining the inspiration in the present to reach those goals. Visiting the institute’s website, I found the follow explanation that vividly illustrated the power of aspiration for me. Very recently I was working with a team of high school educators at an international school building a curriculum for a “student welfare and learning” program. Students will spend the year in small groups (around 10) working with a personal tutor (advisor). As part of my facilitation I asked the team, along with their school administration, to “paint a picture” of the outcomes of a highly successful program. One of the phrases that they used described the students as authentic, lifelong learners. As I questioned them to understand, they said that currently there were students who were not taking advantage of the learning opportunities available. With the new vocabulary of aspiration, I have a label for the outcome they wanted. I can imagine presenting the descriptions of hibernation, imagination, perspiration, and imagination to students. Then having students list the actions and “talk” of a person in each category. Students could then assess and journal “Where am I”? As I looked at the aspirations profile I realized the four categories could be applied to teachers that you might be coaching. What would a teacher in each of these spots sound like and look like? How would you respond as a school leader or coach? Hibernation—I frequently describe this teacher as effective and resistant to coaching. Often this teacher’s performance is “good”. This teacher is unlikely to find teacher evaluation bringing any pressure to improve. By deciding “these students” are doing the best that can be expected, this teacher feels no need to change his/her practice. As a coach I spend my time questioning this teacher about her beliefs and values. A question I might use- “What current student behavior are you interested in changing or initiating? Why would you be willing to invest time and energy in getting this change in students? Aspirations—These are the teachers that make coaches feel like our jobs may be too easy. This teacher is the ultimate lifelong learner. New learning resulting from hard work produces a reward of energy that fuels the next question that drives the work on the next new learning. These teachers see any student lack of progress as a need and opportunity for the teacher’s learning. As student success grows the teacher raises her expectations for the students and thus raises her own aspirations. My coaching role almost mirrors this teacher. Her raising expectations of herself raise my need to learn and grow as her coach. This teacher often coaches the coach. I’m interested how readers see the application of aspirations to coaching? Hope to hear.